The English Longbow, also called theWelsh longbow, is a powerful type of medieval longbow (a tall bow for archery) about 6 ft (1.83 m) long used by the English and Welsh for hunting and as a weapon in medieval warfare. 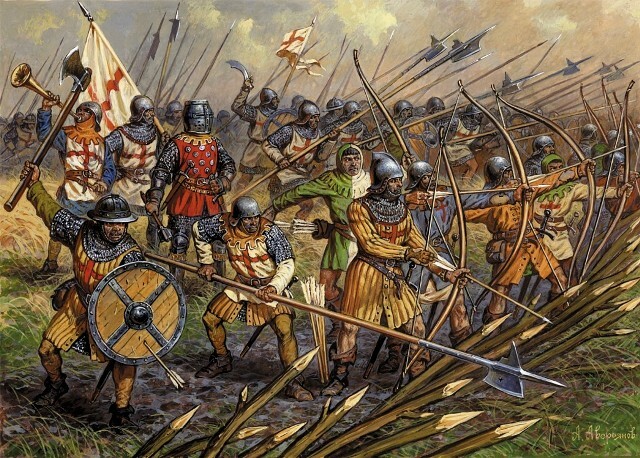 English use of longbows was effective against the French during the Hundred Years' War, particularly at the start of the war in the battles of Crécy (1346) and Poitiers (1356), and most famously at the Battle of Agincourt (1415). They became less successful after this, with longbowmen taking casualties at the Battle of Verneuil (1424), and being completely routed at the Battle of Patay (1429) when they were charged before they had set up their defensive position. The term "English" or "Welsh" longbow is a modern usage to distinguish these bows from other longbows, though in fact identical bows were used across northern and western Europe; indeed a very large proportion of yew bowstaves were imported from Spain from the fourteenth century onward, if not earlier. ecovered from the Mary Rose, a ship of Henry VIII's navy that sank at Portsmouth in 1545. L’arc long anglais, également appelé longbow ou arc droit1, est une évolution de l’arc gallois. Il s’agit d’unarc médiéval très puissant, d’environ 2 mètres de long, très utilisé par les Anglais, à la fois pour la chasse et la guerre. Son utilisation par l’armée anglaise naît de ses déconvenues lors des guerres en Pays de Galles et en Écosse. Les Anglais décident alors d’y recourir massivement, ce qui permet de vaincre les piquiers gallois, puis écossais. Cette arme se révèle encore décisive pendant la plus grande partie de la guerre de Cent Ans (particulièrement lors des batailles de Crécy, de Poitiers et d’Azincourt). De nombreuses solutions sont essayées par les Français pour neutraliser cette arme redoutée : mise à pied des combattants montés, augmentation de la surface protégée par des plates dans les armures, protection des chevaux, neutralisation des archers ou création des compagnies d’ordonnances et des francs-archers. Les Français doivent longtemps se résoudre purement et simplement à éviter de combattre les Anglais de front en rase campagne et réorientent leur stratégie vers une guerre de siège, utilisant la tactique de la terre déserte qui laisse les chevauchées anglaises libres de piller le pays. La stratégie défensive qu’implique l’utilisation de l’arc long est seulement battue en brèche par l’apparition de l’artillerie de campagne : l’armée anglaise est alors décimée à Formigny et à Castillon. Au XVIe siècle, les archers sont définitivement supplantés par les arquebusiers particulièrement par ceux de l'armée espagnole qui combattent au sein des Tercios. 1.- Bacon, Edward (1971). Archaeology: Discoveries in the 1960s. New York: Praeger. 2.- Kaiser, Robert E. (1980). "The Medieval English Longbow". Journal of the Society of Archer-Antiquaries 23. 3.- Levick, Ben (1992). "They Didn't Have Bows, Did They?". Regia Anglorum Publications 2002. Great!I wanted to know about the Longbow! Thanks mate. And it's just the first part! 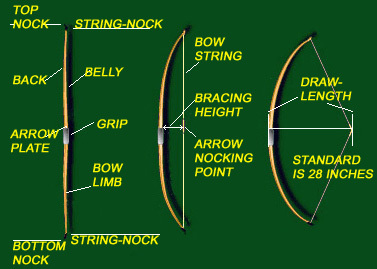 A longbow must be long enough to allow its user to draw the string to a point on the face or body, and the length therefore varies with the user. 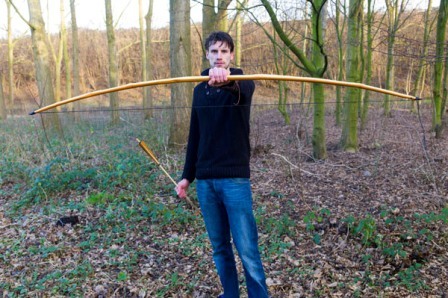 In continental Europe it was generally seen as any bow longer than 1.2 m (4 ft). The Society of Antiquaries says it is of 5 or 6 feet (1.5–1.83 m) in length. Richard Bartelot, of the Royal Artillery Institution, said that the bow was of yew, 6 feet (1.83 m) long, with a 3 foot (914 mm) arrow. Gaston Phoebus, in 1388, wrote that a longbow should be "of yew or boxwood, seventy inches [1.78 m] between the points of attachment for the cord". Historian Jim Bradbury said they were an average of about 5 feet and 8 inches. All but the last estimate were made before the excavation of the Mary Rose, where bows were found ranging in length from 1.87 to 2.11 m (6 ft 1 in to 6 ft 11 in) with an average length of 1.98 m (6 ft 6 in). Estimates for the draw of these bows varies considerably. Before the recovery of the Mary Rose, Count M. Mildmay Stayner, Recorder of the British Long Bow Society, estimated the bows of the Medieval period drew 90–110 pounds-force (400–490 newtons), maximum, and Mr. W.F. Paterson, Chairman of the Society of Archer-Antiquaries, believed the weapon had a supreme draw weight of only 80–90 lbf (360–400 N) . Other sources suggest significantly higher draw weights. The original draw forces of examples from the Mary Roseare estimated by Hardy at 150–160 lbf (670–710 N) at a 30-inch (76.2 cm) draw length; the full range of draw weights was between 100–185 lbf (440–820 N). The 30-inch (76.2 cm) draw length was used because that is the length allowed by the arrows commonly found on the Mary Rose. A modern longbow's draw is typically 60 lbf (270 N) or less, and by modern convention measured at 28 inches (71.1 cm). Historically, hunting bows usually had draw weights of 50–60 lbf (220–270 N), which is enough for all but the very largest game and which most reasonably fit adults can manage with practice. 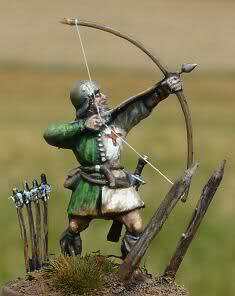 Today, there are few modern longbowmen capable of using 180–185 lbf (800–820 N) bows accurately. 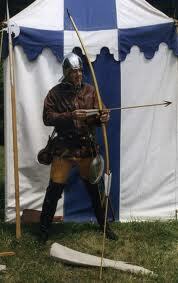 A record of how boys and men trained to use the bows with high draw weights survives from the reign of Henry VII. [My yeoman father] taught me how to draw, how to lay my body in my bow ... not to draw with strength of arms as divers other nations do ... I had my bows bought me according to my age and strength, as I increased in them, so my bows were made bigger and bigger. For men shall never shoot well unless they be brought up to it. the Englishman did not keep his left hand steady, and draw his bow with his right; but keeping his right at rest upon the nerve, he pressed the whole weight of his body into the horns of his bow. Hence probably arose the phrase "bending the bow," and the French of "drawing" one. The preferred material to make the longbow was yew, although ash, elm and other woods were also used.Giraldus Cambrensis, Gerald of Wales, speaking of the bows used by the Welsh men of Gwent, says: "They are made neither of horn, ash nor yew, but of elm; ugly unfinished-looking weapons, but astonishingly stiff, large and strong, and equally capable of use for long or short shooting." The traditional construction of a longbow consists of drying the yew wood for 1 to 2 years, then slowly working the wood into shape, with the entire process taking up to four years. (This can be done far more quickly by working the wood down when wet, as a thinner piece of wood will dry much faster.) The bow stave is shaped into a D-section. The outer "back" ofsapwood, approximately flat, follows the natural growth rings; modern bowyers often thin the sapwood, while in the Mary Rose bows the back of the bow was the natural surface of the wood, only the bark being removed. The inner side ("belly") of the bow stave consists of rounded heartwood. The heartwood resists compressionand the outer sapwood performs better in tension. This combination in a single piece of wood (a self bow) forms a natural "laminate", somewhat similar in effect to the construction of a composite bow. Longbows will last a long time if protected with a water-resistant coating, traditionally of "wax, resin and fine tallow". The trade of yew wood to England for longbows was such that it depleted the stocks of yew over a huge area. The first documented import of yew bowstaves to England was in 1294. In 1350 there was a serious shortage, and Henry IV of England ordered his royal bowyer to enter private land and cut yew and other woods. 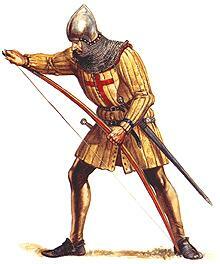 In 1470 compulsory practice was renewed, and hazel, ash, and laburnum were specifically allowed for practice bows. Supplies still proved insufficient, until by the Statute of Westminster in 1472, every ship coming to an English port had to bring four bowstaves for every tun. Richard III of England increased this to ten for every tun. This stimulated a vast network of extraction and supply, which formed part of royal monopolies in southern Germany and Austria. In 1483, the price of bowstaves rose from two to eight pounds per hundred, and in 1510 the Venetians obtained sixteen pounds per hundred. In 1507 the Holy Roman Emperor asked the Duke of Bavaria to stop cutting yew, but the trade was profitable, and in 1532 the royal monopoly was granted for the usual quantity "if there are that many". 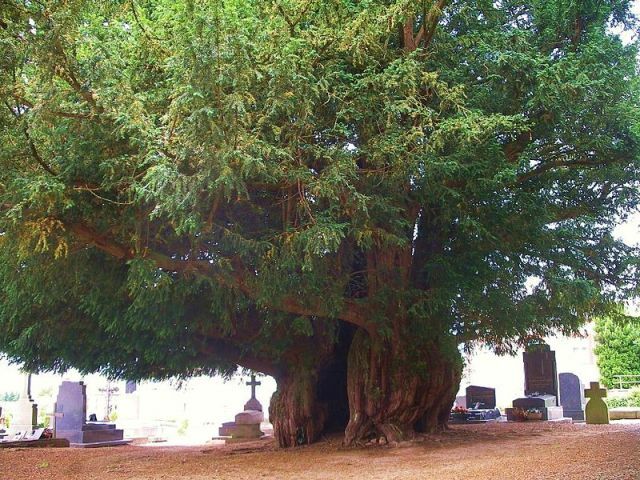 In 1562, the Bavarian government sent a long plea to the Holy Roman Emperor asking him to stop the cutting of yew, and outlining the damage done to the forests by its selective extraction, which broke the canopy and allowed wind to destroy neighbouring trees. In 1568, despite a request from Saxony, no royal monopoly was granted because there was no yew to cut, and the next year Bavaria and Austria similarly failed to produce enough yew to justify a royal monopoly. Forestry records in this area in the 17th century do not mention yew, and it seems that no mature trees were to be had. The English tried to obtain supplies from the Baltic, but at this period bows were being replaced by guns in any case. 11. ^ Strickland & Hardy 2005, pp. 13,18. 12. ^ Cohu, Will (3 April 2005). "How they did affright the air at Agincourt". Daily Telegraph. A review of The Great Warbow "The power of a bow is measured in its draw-weight, and these days few men can pull a bow above 80lb... and skeletons retrieved from the wreck show spinal distortions, indicating just what it took to be a proper archer." Oakeshott, R. Ewart (1960). The Archaeology of Weapons. London: Lutterworth Press. Trevelyan, G. M. (2008). English Social History – A Survey of Six Centuries – Chaucer to Queen Victoria. READ BOOKS.